I wanted to know what are the limits of the speedrun to be able to guess the proper time for the speedrun achievement. I found that AntiElitz is the current holder of the record with the unbelievable time of 2:26:21. You can watch the youtube video of the deed. I watched it all and I learned a lot of new setups and techniques, I was really surprised by the level of the skill. Bravo. It is now possible to specify achievements as data the same way as other prototypes, which means they can be added and modified with mods. You can also list all the achievements ingame (Mainly important for the future non steam users) and get a notification when you unlock it. Let me show you example of the only hidden achievement in the game (You can guess how to get it). I have created 23 achievements so far. Many of these were inspired by your submissions in the reddit and forum threads, thanks for the ideas. Progress - The easiest ones, their purpose is mainly to make the player feel invested and to make it publicly visible how many stopped playing in each of the game phase on the steam statistics . Example: Research certain technology, research all technologies, trigger biter attack etc. Exploration - Similar to progress, but guides you to use optional mechanics. Example: Construct/Deconstrut with robots, build train. Teaching - Teaches you different strategy or build order. Example: Build train early on. Production - Motivates you to make big factories, we have overall achievements (create X million circuit circuits) and per-hour achievements (smelt X iron ore per hour). Fight - The only ones we have so far is using tank to destroy trees and biter nests. Some other fight achievements could be added, but it shouldn't be too much, so the game doesn't feel like a fighting game, which it isn't. Challenge - These are the interesting ones, win the game without solar panels, roboports, laser turrets or without crafting more than 111 items manually. There are also speedruns, The current variants are 10 and 6 hours to finish the game (I should probably try to beat the achievement personally, because I'm not really sure if I could). The question is whether there should be many more achievements or not, and what categories should be expanded the most. I don't want to add many more achievements that would require the player to play from start to finish, as it might be more annoying than challenging. It is also a hard to decide the conditions required to gain an achievement. The only limitation we have now is no mods (modded achievements are possible, but they are separated) and no use of the console. There might be others, like limitation to freeplay, limitation of resource settings, peaceful mode and other. Do you think that we should limit it a lot, so some of them are bigger challenge, or leave it up to the players? What do I need to research to get to certain technology. To see specific dependencies of a technology and what it will come after it. So we decided to just make a small sub-tree of technologies related to the one currently selected. The results look promising, and we will present what it looks like in a future Friday facts. We've got a lot of feedback after the update of the work in progress on the circuit connector in the recent friday facts post. 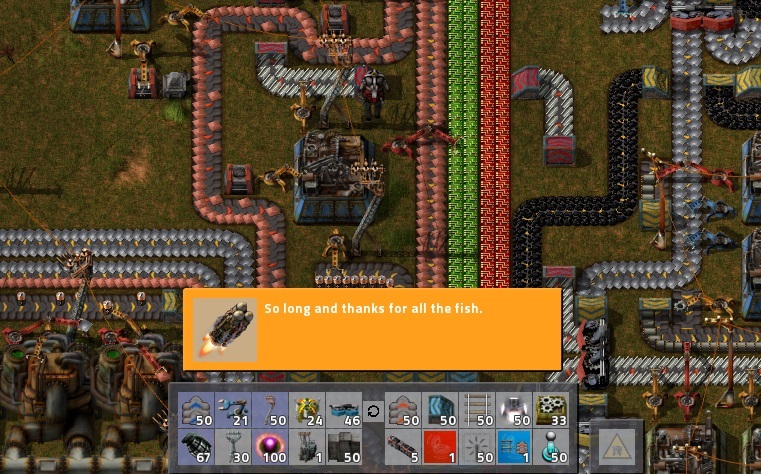 The people were basically saying, that they don't like the idea that everything connectable to circuit network (even inserters) will need a special entity next to it. So we decided to reopen the subject, and after discussing it thoroughly we decided to change the plan. The new plan is, that almost every machine will be directly connectable to the circuit network the same way as before. This still means, that the smart inserter and smart chest will be removed, as everything will be connectable, even the regular chests, inserters or even belts. There will be some general graphics of tiny antenna attached to the object once it is connected to the wire, so it doesn't look too funny. Michal had been given the task to work on the new turrets. We wanted to have some simple prototypes that can be tested before deciding about the configuration and graphcis specifications. The problem is, that the first turret we chose to do was the flamethrower one. To make the flamethrower turret, we first needed to upgrade the current flamethrower mechanics, so we had to make the mechanics of things catching on fire which finally leads to mechanics of forest fire. As you can see, the task can recursively derail quite quickly, but it is part of the job. Let me present you the current work in progress of the forest on fire.